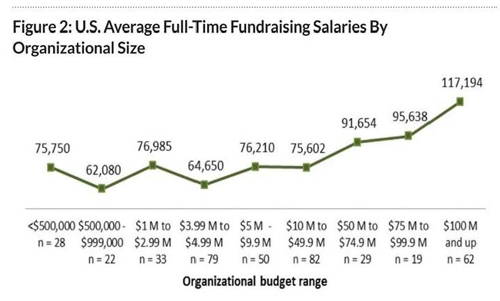 As a fundraising consultant, the Study is my go-to reference for critical data points used to recommend salary ranges and benefits that will attract the highest caliber of applicants for our clients. Additionally, the Study offers some key insights into the cultural characteristics and attributes that can play a pivotal role in job satisfaction. As an example of the Study’s usefulness, I’ll cite our firm’s recent experience managing a search for a large human service organization with services across multiple counties. Because the development director’s position had experienced some turnover in the last five years, we were aware that issues related to that elusive “fit” were costing our client in terms of time and unrealized fundraising gains. We began our work by examining the work challenges identified by Study respondents, including leadership, resource and procedural issues. Are philanthropy, development and accountability understood and valued throughout the organization? Are there sufficient staff to get the job done/too many competing duties assigned to this development position? We determined that, before this position was posted, executive and leadership volunteers needed to clearly understand the importance and value of philanthropy; and that there needed to be a realignment of administrative responsibilities to ensure the new development director could concentrate his/her time to fundraising and stewardship. Also, as a result of this examination, the position was elevated to serve as part of the executive management team. Next, we discussed our client’s preferences regarding education and professional experience. 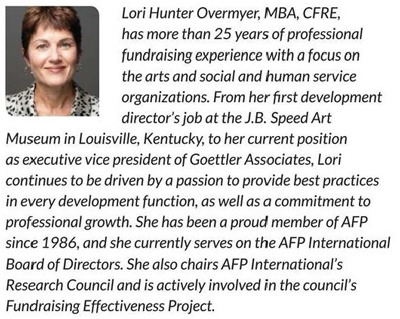 It was determined that the position would require a BA and 10 to 14 years of development and nonprofit management experience, with a preference for a candidate who holds a CFRE (Certified Fund Raising Executive) or ACFRE (Advanced Certified Fundraising Executive) credential. Tables in Appendix 4 of the Study gave us data on salary ranges related to personal characteristics including education level, years of experience, and certification. We examined the Study’s data on salaries by budget size (Figure 2) but because this multi-million dollar agency was relatively new to fundraising, we knew it would require an experienced professional – one that both board and staff could look to as their resident expert – to successfully establish a fully realized development department; therefore, the typical correlation between organizational budget size and funds raised did not apply. Establishing the salary range to offer was the final piece of the puzzle. 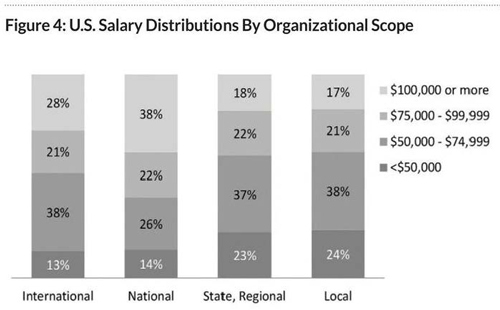 To determine this, we compiled data gleaned from salaries by region (Figure 3), organizational focus, scope of service (Figure 4), and the population of the organization’s locale. 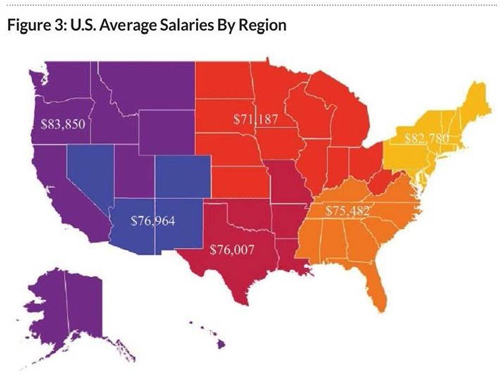 Based on all of these factors, our client opted for a salary range that started at the lower Median Salary point up to the higher Mean Salary point, which put them somewhere around the 50th Percentile. Finally, we reviewed the Study’s findings regarding medical and health benefits, retirement benefits, and other work-related benefits such as paid leave, bonuses, professional dues, etc. A helpful table in Appendix 6 provided information on benefits by position level, which in our case was Chief Development Officer. This suggested a list of non-traditional benefits that could be packaged on top of medical, dental and vision insurance as added enticements. We are happy to report that the job posting attracted a field of qualified candidates, and a match was made! Using data from the Study’s findings allowed this organization to position itself for success. The difficult internal conversations took place prior to the search, and our client fully understood the competitive market, thanks to the data from the AFP Compensation and Benefits Study. 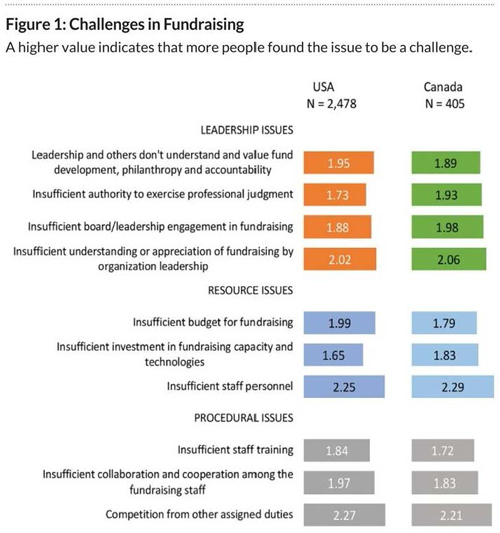 While our work utilized the research for U.S. organizations, the Study has an equally robust set of findings for Canada by sector, region, organizational type, salary ranges, and benefits packages. There are a number of other compensation studies out there that may provide useful information, but this annual AFP publication – available free to members – is a “one stop shop” for the critical factors related to employment in our industry.